This page lists additional resources to help you find materials for your Tech Challenge solution; learn about federal and state standards and how they relate to our program; and find out more about how The Tech Challenge can help students develop 21st-century skills. These lessons were developed to support school and afterschool programs as they engage all students in engineering, and to help build up to The Tech Challenge 2019. They were designed and written by members of the Tech Academies of Innovation for students in Grades 4-8. During this engineering based lesson, students build, test and modify hovering devices in a wind tunnel to expand knowledge of design and aerodynamics. During this science focused lesson, students explore the force of lift in a hovercraft and then create a labelled drawing to explain the forces involved in creating a working hovercraft. During this ELA focused lesson, students conduct weight distribution experiments with paper airplanes in order to get information to share in a short presentation. There are many ways to relate The Tech Challenge to what your students are doing in the classroom. The design process — engineers’ basic approach to problem-solving — involves many practices. They include problem definition, model development and use, investigation, analysis and interpretation of data, application of mathematics and computational thinking, and determination of solutions. These engineering practices incorporate specialized knowledge about criteria and constraints, modeling and analysis, and optimization and trade-offs. The CCSS Literacy Standards were written to help students meet the particular challenges of reading, writing, speaking, listening and language in various fields — in this case, science. The literacy standards do not replace science standards; they supplement them. The NGSS lays out the core ideas and practices in science that students should master in preparation for college and careers. The Tech Challenge aligns with standards in reading, writing, speaking and reading. 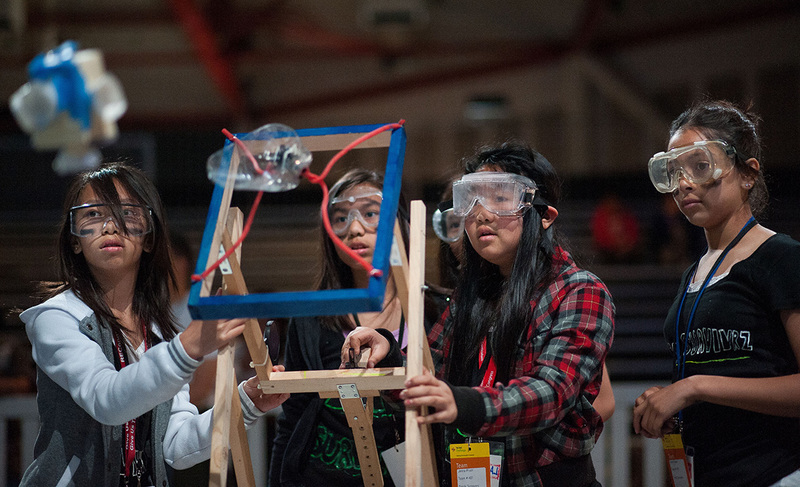 The Tech Challenge helps students build 21st-century skills such as critical thinking, communication and teamwork. To learn more about 21st-century skills, click here. Watch our YouTube series to learn how to safely use tools that you'll need to build your device. the source of your ideas. how you worked as a team. how you tested your solution. What idea did you choose as your solution? Why? How would your design work in real life? What did you choose to document in your journal? Why? How did each of you contribute? How did you build your solution? Goodwill and Salvation Army stores. Click here for online store and locations. This store is open only to educators. Ask your teacher if he or she is a member. Adviser: A person at least 18 years old who monitors safety, acts as a mentor and who may provide things like transportation and snacks. Your team should only have one adviser, and he or she shouldn't give you all the answers or do the project for you. Airboat: Fan-driven boat of the type used in the Everglades. Unlike hovercraft, which hover above the water while in motion, airboats remain in the water while moving. Air Currents: Air moving due to differences in pressure or temperature. Air Gap: See Daylight Clearance. Alternating Current: Abbreviated AC. Electric current which periodically reverses direction, as opposed to direct current (DC), which flows only in one direction. Amp, ampere: Unit of measurement of electrical current. Battery: A device consisting of one or more electrochemical cells with external connections provided to power electrical devices. Brainstorming: Coming up with ideas — sometimes crazy ones — for a solution to a problem. It's possible to brainstorm on your own, but most find it works best as a team activity. Capacitor: A device used to store electrical energy. Centrifugal Fan: Aka "blower" or "squirrel cage fan" (it looks kind of like a hamster wheel). These fans move air radially, changing the direction of the airflow. They are quieter than standard fans like you'd have at home to cool a room. Centrifugal Lift Fan: A fan that looks like a funnel inside a donut-like chamber. It has angled slats around the outer edge of the chamber. When the funnel-shaped part rotates at high speed, air is sucked into the chamber and forced out through the slats. Christopher Cockerell: Inventor of the hovercraft as we know it. Conductivity: The property of conducting or transmitting heat, electricity, etc. Constraints: A control or limit to a design. For example, a constraint might be that your device can't weigh more than three pounds. Circuit: The complete path of an electric current through an assemblage of electronic elements. Current: The flow of electricity through a wire or circuit. Cushion Area: The area between the bottom of a hovercraft and the surface below while the hovercraft is operating. Daylight Clearance: The space between the bottom of the skirt and the surface upon which the craft is hovering. Also known as the Air Gap. Design: The creation of a plan for the construction of your device. Sometimes used to refer to the device itself. Device: The gizmo you and your team are designing, engineering and building that will meet The Tech Challenge. Direct Current: Abbreviated DC. A continuous electric current that always flows in one direction. Drag: The opposite of thrust, created by friction. Hovercraft minimize drag by riding on a cushion of air. Dry Cell Battery: A type of battery used for portable devices such as radios, smartphones, flashlights etc. Dynamic Pressure: Pressure of air that is in motion. Engineer: People who design, construct and test devices, materials and systems while considering the constraints caused by safety, practicality, rules and cost. Engineering Analysis: Looking at a problem using scientific analytic principles and processes so you can see the properties of what you are designing. To start, break down a problem into its basic parts to look at the relationships between its pieces and things other than your device. Engineering Journal: A record of all the brainstorming, research, prototyping and other work that goes into developing your team's device. Failure: Sometimes you feel this when your device doesn't work but a big part of engineering is finding failure points and fixing them. Running into a roadblock with your device is an opportunity to use your engineering brain to make your device better. Failure point: When a break in a system (or device) causes a device to work improperly or not work at all. One of the jobs of an engineer is to find failure points so they can fix them, and it's one of the reasons we test over and over. Fan: A rotating arrangement of four or more blades used for producing air currents. Hovercraft have two kinds of fans: the central or lift fan, pointing downward, and one or more other fans pointing backward. The central fan creates the lift that causes a craft to hover. The other fans provide the thrust that propels the craft. Final Design: The final plan for the construction of your device, agreed upon by the whole team. The team develops the final plan after brainstorming, prototyping and testing again and again. Sometimes this term is used instead of Final Device. Final Device: The device your team will bring to the showcase — the product of all your team's brainstorming, designing, prototyping, testing and re-testing. Finger Skirt: Aka Segmented Skirt. A type of skirt consisting of several segments that press together when inflated. Fluid: A liquid or gas that conforms to a shape surrounding it, like water in a glass. Surprise! Air is a fluid. Four Forces of Flight: Lift, weight (gravity), thrust, drag. Friction: When one object rubs against another, it creates friction. What happens when you and another person try to go through a door at the same time? You probably bump up against each other, causing friction, which makes it difficult for either of you to get through the door. Gravity: The force that brings any two objects together, e.g. you and the Earth. See also Weight. Ground, Grounding: An object that makes an electrical connection with the Earth in order to prevent you from being shocked. Ground Effect: The buoyancy produced by a cushion of air below a vehicle moving close to the ground. Hover Gap: The space between the bottom of the hovercraft and the surface below while the vehicle is in operation. Hoverboard: A fictional device, usually described as a skateboard without wheels. Generally these are depicted, as in "Back to the Future 2 and 3", as anti-gravity devices and therefore do not function as the ACV we're studying. No one has built one successfully. Yet. Impeller: Part of a pump that rotates at a high speed, acting as a propeller to increase a fluid's pressure and flow rate. A fan is an impeller. Innovator: Someone who creates something new or makes changes to something that already exists in order to meet a specific need. For example, you and your team as you design, engineer and build a hovercraft. Insulation: A material or substance that is used to stop heat, electricity or sound from going into or out of something. Integrated Hovercraft: Hovercraft which uses one fan for both lift and thrust. Iteration: The different versions of the device you build as it changes due to the Engineering Design Process. LCAC: Landing Craft Air Cushion. Military hovercraft with a range of 482 miles designed to transport up to 173 tons of personnel/supplies/other military vehicles. Lift: The force that causes an aircraft to rise. In hovercraft, lift is provided by a powerful central fan pointed downward. Lift Fan: The central fan that causes a craft to hover. Lift Perimeter: A theoretical line around the perimeter of a hovercraft where the lower edge of the skirt makes contact with the surface beneath the craft. Lift Pressure: See Cushion Pressure. Lithium-Ion Battery: A rechargeable battery that uses lithium ions as the main component of its electrolyte. Common in portable electronic devices such as cell phones and laptop computers. Living Document: A document that is continually being updated. For example, your engineering journal. Momentum Curtain: Cockerell's term for the downward ring of high-pressure air that traps a cushion of air under a hovercraft, producing lift. Motor: Any machine that converts electrical energy into mechanical energy. Nominal: Approximate; that is, there may be minor variances between the measurements stated in the rules and drawings and the actual test rig. Perseverance: Not giving up in the face of failure. Your team may experience setbacks, but it doesn't have to give up. Getting past those failures can be fun and rewarding. Pit: The area where, during the showcase days, you and your team will make your final preparations before judging. Plenum: The hollow part underneath the hovercraft where the air gathers. Plenum Chamber: A pressurised housing containing a gas or fluid (typically air) at pressure higher than outside the chamber. Propeller: A rotating device with blades attached to a boat or aircraft, providing thrust. An engine makes the propeller spin around and causes the vehicle to move. Propellers usually have no more than four blades. More than four blades and the device is called a fan. Repeatability: The ability of your device to demonstrate the same results under the same conditions, i.e. to work every time you test it. Resistance: The ability to of a substance or circuit to stop the flow of electrical current through it. Safety: Your No. 1 priority! Safety involves using tools correctly, wearing your hard hat and goggles when working on and testing your device, and more. While your team should appoint a safety monitor, everyone on the team is responsible for safety! Segmented Skirt: See Finger Skirt. Shock: Sudden stimulation of the nerves and convulsive contraction of the muscles caused by the discharge of electricity through the animal body. Skimmers: Another name for hovercraft. Others include air cushion vehicles, ground effect machines/vehicles and surface skimmers. Skirt: Part of a hovercraft that traps a cushion of air under the craft, allowing it to float on a pillow of air. Solution: The design your team builds that will meet The Tech Challenge. Solder, Soldering: A metal or metallic alloy used when melted to join metallic surfaces. The Spirit of the Challenge: The Tech Challenge emphasizes the importance of engineering solutions that would be practical in real life. Test rigs involve small-scale replication of real-world conditions. Teams should develop designs that represent real-life solutions. SSC: Ship-to-Shore Connector. Military hovercraft which will replace the LCAC. Has a longer range and is able to carry more stuff than the LCAC. Also, easier to build and maintain. Static Pressure: Pressure of a stationary region of air. Static pressure is what lifts a hovercraft. Terrain: The physical features of a piece of land. Test Rig: The thing your team will test its device on. The Tech Challenge designs an official test rig. We also design a simple version you can build so you can test at home or school. Thrust: The force that causes an aircraft to move forward. In hovercraft, thrust is provided by fans mounted to the back of the craft. Thrust Engine: The engine that provides thrust for a hovercraft, usually by spinning a propeller or fan. Volt: A unit for measuring the force that moves an electric current. Weight: The combined load of an aircraft, crew, fuel and cargo. Weight pulls an aircraft downward because of the force of gravity. Last revised in 2014, there’s a lot of good information here. And safety is a timeless concept. University of Colorado, Boulder's excellent site includes over 1,500 challenges and activities. Designed principally for educators. No activities, but clear explanations of complex subjects. A good site showcasing a wide variety of topics. Their physics pages offer good explanations of complex subjects, as well as a few activities. Physics lessons intended for working adults, though the reading level is that of older or more sophisticated students. A real rabbit hole. Not only are there clear explanations of sometimes complex subjects, there's a list of additional resources that can keep you surfing for hours. Lots of information, history etc. Humanitarian charity using hovercraft to reach isolated communities. The Mercury News article about possible local uses for hovercraft. Hovercraft feature prominently in this study led by the San Jose-Silicon Valley Chamber of Commerce and the Santa Clara Valley Water District. These books are either available at your local library or inexpensively through Amazon. "Prototyping (21st Century Skills Innovation Library: Makers as Innovators)"
"Mechanical Engineering in the Real World (STEM in the Real World Set 2)"
"Engineering: Cool Women Who Design"
"I Want to Be an Engineer"
"Ships and Submarines (How it Works)"
"How Things Work: Discover Secrets and Science Behind Bounce Houses, Hovercraft, Robotics, and Everything in Between"
"Make: Tips and Tales from the Workshop: A Handy Reference for Makers"
"Kinetic Contraptions: Build a Hovercraft, Airboat and More With a Hobby Motor"
"Amazing Makerspace DIY BAsic Machines"
"Super Simple Aircraft Projects: Inspiring & Educational Science Activities (Amazing Super Simple Inventions)"
"Klutz Air Power: Rocket Science Made Simple Craft Kit"
"Billy Sure Kid Entrepreneur and the Haywire Hovercraft"
"Physics (investigate the Mechanics of Nature)"
"125 Physics Projects for the Evil Genius"
"Science Comics: Flying Machines: How the Wright Brothers Soard"
"Encyclopedia of Electronic Components Volume 1"
"Encyclopedia of Electronic Components Volume 2"
"Encyclopedia of Electronic Components Volume 3"
"Solar Cell and Renewable Energy Experiments"
"The Complete Idiot’s Guide to Electronics 101"
The Hovercraft: Where did it come from? Short history of Chris Cockerell and the invention of the Hovercraft. They were once known as the 'Concorde of the Seas': mighty flying boats that ferried their passengers with speed and style. Hovercraft that once traversed the 22-mile English Channel from England to France carrying hundreds of passengers and cars are no longer with us. So what happened to the giant hovercraft SN-R4? A 2009 TV program about the english channel hovercraft. Historic stock footage of a hovercraft being demonstrated on Lake Merritt in Oakland CA. This would be the first commercial use of a hovercraft in the U.S.A. and would ferry passengers between Oakland and SFO. Year 1965. A look at the ‘new’ hovercraft revolution in 1962. Various forms of hovercraft for different uses. Mechanical engineer Rob Bell Shows us how hovercrafts work. Full episode all about friction and how it relates to hovercraft. Miniature Mythbusters from the Discovery Channel. Can you drive a hovercraft through a minefield explosion-free? Professional golfer Bubba Watson’s hovercraft golf cart by Oakley. Assembly and testing of a homemade hovercraft on multiple terrains.